2017 began with unprecedented events. We are reminded of the value of education, and many of us are motivated to reconnect with Wellesley. • February 25: One of Gretchen’s joys in serving as class secretary has been hearing from you and keeping in touch. Please send her a line, pick up thephone, or e-mail her so she can share your news with our class: Dr. Gretchen Rous Besser, 3679 Stagecoach Road, Morrisville, VT 05661, grbesser@gmail.com, 802-888-3967. Deadline for the upcoming Wellesley magazine: February 25, 2017.
have exceptionally embodied the motto “Non Ministrari, sed Ministrare.” To submit nominations, please use the form on Wellesley’s website. Click here to get the online form. • April 26: New England alumnae - Look for a “Save the Date” card in the mail. A mini-reunion on campus is again planned for Wednesday April 26th in conjunction with the Ruhlman Conference. The Conference fosters collaboration among students and faculty across disciplines. Join classmates in viewing student presentations on a range of fascinating topics and for a luncheon at noon at the College Club. If other classmates plan to be in the area at that time and wish to be included, please contact Scottie as soon as possible: 802-649-1324, nhdean@comcast.net. Scottie was happy to represent the class at the inauguration of our new College President, Paula Johnson. There were only two blue classes there, ’45 and ’49, so those two delegates marched together at the head of all the alums. The huge tent, which housed hundreds that day, was beautifully decorated. Highlights were the speeches of Senator Elizabeth Warren, representing the Commonwealth, Harvard University President Drew Gilpin Faust, and Smith College President Kathleen McCartney. Preparations had been made for rain, but it held off ‘til nearly 5 o’clock. Scottie took lots of photos, hoping to share them, but after she got home, her camera disappeared. with Laura Adamczyk from Wellesley’s Office for Resources. Gretchen reports that she and her husband Al have been in thrall to the peace and stillness of a good old-fashioned snowstorm, with thick flakes falling over pasture and woods, hushing sounds and bedecking trees. It was a welcome pre-Valentine gift for Vermont skisports lovers of all ages. • 60% of students receive financial aid. • Our need-blind admission policy is backed by a commitment to meet 100% percent of a student’s demonstrated need. • 95% of our average financial aid award is given in the form of a scholarship or grant that does not have to be repaid. • Wellesley is widely recognized as one of the top 10 colleges in the country for students graduating with the least amount of debt. 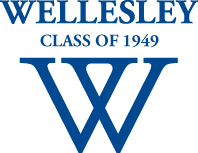 • There are 10 active alumnae in the Wellesley network for every student on campus. experience! Thank you all again! The alums in New Hampshire and Vermont are preparing for the 5-college book sale in April so that we can send scholarship money for the College. With sea changes taking place in our present world, it is more important than ever that young women receive a strong liberal education that will open their minds, buttress their self-confidence, and inspire their resolve to help build a bright future. As for us, let’s stay connected to each other and committed to Wellesley.